We find it pleasant to work with Visual LANSA and it allows us to deliver smart solutions, quickly. PGI Nonwovens B.V. in the Netherlands (PGI) is part of Polymer Group, Inc., a global supplier of engineered materials and one of the world's leading producers of nonwoven materials for medical, hygiene, wiping, industrial and specialty uses. PGI used Visual LANSA to automate over 30 production lines in its converting and manufacturing plants in Cuijk in the Netherlands. The applications integrate in real time with PGI's PRMS ERP system and drive barcode scanners, label printers and robotic devices for counting and packing products and applying labels. Fred Rambow, IT manager at PGI Nonwovens, says, "With the LANSA applications and related process changes, we have increased throughput without adding any production lines and achieved a fifteen percent reduction in labor in both our converting and manufacturing divisions. We have done this with our own small team at a fraction of the cost of a packaged solution. Plus we have a 100 percent fit." We increased throughput without adding any production lines and achieved a fifteen percent reduction in labor. PGI, through its Chicopee Wiping division, is the supplier of well-known brand names, such as Chux, Dusty, B-Clean, Quix Wet, Lavette, J-Cloth, Super-Twill, Ko-Ton, Triko-Tex and Econoline. 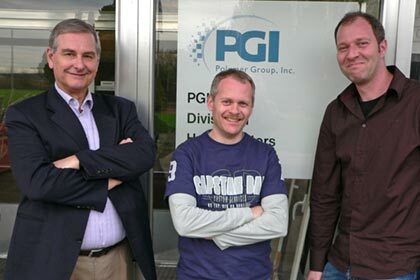 From its offices in the Netherlands PGI looks after the entire European and Middle East markets. Major customers include hospitals, retailers, industrial clients and its largest customer and former owner Johnson & Johnson. PGI has a long history of using IBM midrange servers and has been using the PRMS ERP system since 1987. Initially PGI used RPG to customize and enhance its PRMS implementation. While the ERP back office applications were running fine on the System i, Rambow saw further opportunities for increasing the company's efficiency that required PC-based solutions that could integrate with the ERP system. Rambow explains, "In the mid-nineties we wanted to give sales reps in other countries access to customer and sales history from their laptop. We also wanted to automate production lines and forklifts with barcode scanners, label printers, WiFi and other devices. Obviously we could not use RPG to automate these PC-based processes, so we looked for a tool that could help us deliver PC-solutions that could also tightly integrate with our ERP implementation on the System i." "I wanted to maintain a small IT team and use the same developers for both Windows and System i development. After evaluating several development tools, LANSA came out on top because it offered standalone PC and System i deployment, as well as supporting client/server configurations." After purchasing LANSA PC (the predecessor of Visual LANSA) in 1995, PGI built a wireless 5250-solution that allowed forklift trucks drivers to see the location of materials that needed to be picked up or stored. At the time PGI was using an aging IBM S/38 with performance problems, further aggravated by the slow wireless communication with the forklift trucks. "We were new to LANSA and to new to WiFi and it wasn't a success. But LANSA kept intriguing us as a development tool and we decided to use LANSA again on our next project, which was truly PC based." I wanted to maintain a small IT team and use the same developers for Windows and System i development. Using LANSA, PGI then delivered a small but successful Windows application that gave remote sales reps, in France, England and the Netherlands, a view of sales figures and budgets from their laptops. The raw data was generated by PGI's PRMS ERP solution and available for download from PGI's head office web server in the US. The Visual LANSA application imported data relevant to that sales rep and massaged it into a Sybase database on the laptop. "The application shows sales history and recent sales transactions in a friendly graphical format. This allows the sales reps to communicate more effectively with their customers and negotiate with more knowledge and confidence," says Rambow. "Clear proof of the application's success were the phone calls from the sales reps we got immediately when the site was down." Over the years this application has grown and became more graphical as PGI upgraded to newer versions of Visual LANSA. Sales reps can download information whenever they want and the solution allows them to analyze data off-line and take the laptop with them into the meeting with their customers. Sales reps can communicate more effectively with their customers. After the success of the sales system, Rambow saw an opportunity to use Visual LANSA in PGI's manufacturing environment. 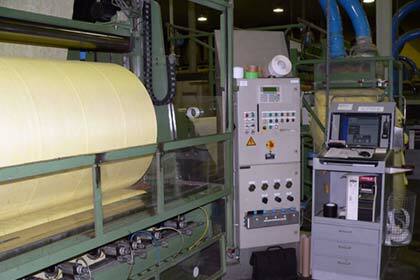 The manufacturing division first produces large master rolls of material, which may hold 6,000 meters of fabric. The master rolls are then cut into slits of, for example 2,400 meters. Each slit gets a barcode label and several are packed onto a roll, wrapped in plastic and labeled. The labeled rolls are collected with a forklift and moved to the warehouse. When customer orders are received the converting division gets these rolls from the warehouse, cuts the fabric into small wipes and packages the wipes for distribution. Operators in the converting division were still using old hand-held terminals to scan barcodes of the materials used and to enter the hours they worked. Data was uploaded to the System i twice a day at the end of each worker's shift. Back office staff would then add additional production information and release it for further processing by PRMS. This process was cumbersome and time consuming as back office staff often needed to go back to the production department for missing or incorrectly entered details and for copies of the bill of materials and work orders. Rambow wanted to improve the process by capturing information right at the source by putting workstations at each of the 12 converting production lines. Visual LANSA was used to build a solution that prompted operators to complete work order details on the spot and updated the System i data in real time. The solution runs on 12 Wyse thin client terminals with Microsoft Terminal Server operating system that communicate via Wi-Fi. The Visual LANSA solution was developed and implemented in a very short time, six months by a single developer. "Information is checked and corrected immediately at the source, which avoids the need for expensive correction procedures by back office staff further down the track. Moreover, System i production and order information data is now updated in real time, as boxes roll off the line." "Production staff, many of them not familiar with using computers, found the solution easy to use and readily accepted the new procedures," says Rambow. As is always the case after a successful IT implementation, the converting division asked for more. They wanted to use robotic devices to print and apply labels with customer information to the boxes of packaged wipes as they left the production line. PGI's development team, at that time unfamiliar with developing software that integrated with robotic devices, decided to give it a try with Visual LANSA. And they succeeded. The solution involves three Visual LANSA programs. The first uses a .COM port to read the production line's PLC (programmable logic controller) to find out whether a box is approaching. The PLC reads the barcode on the box that indicates the type of product. A second program keeps track of the current production orders by communicating directly with PGI's System i and updating data in the PRMS ERP system. This program also determines which information needs to be printed on the label and updates a label file. The third Visual LANSA program responds to every box that passes, recognizes the box by checking the barcode via a COM port and reads the label database file. If a label needs to be printed, this program sends the label information to the label printer, via a COM port. Next the PLC will kick a robot into action to stick the label on the box. Rambow says, "The time from a box approaching the PLC to sticking on the label and updating the ERP is only five seconds. The application let us increase our throughput without adding production lines and without increasing staff numbers or shifts." System i production information is now updated in real time, as boxes roll off the line. The workstation with scanner, screen and label printer sits next to a slitter machine in PGI’s manufacturing department. Having seen the success of the converting division, PGI's manufacturing division was interested to achieve similar gains. 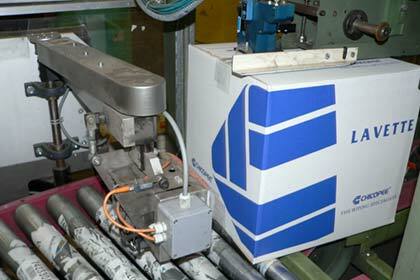 The manufacturing division was working with an unsupported barcode scanning and labelling network. "It met the basic requirements, but provided no information beyond that. There was no connection with our ERP system. Every work order needed to be printed, resulting in large stacks of paper with production details, including the bills of materials. After every shift, the manufacturing department would send stacks of paper back to the office for entry in the ERP system." As they had done for the converting division, Rambow and his team put a similar work order and product registration solution in place with Visual LANSA. But as work orders for manufacturing are more complex, the solution was more complex as well. Next came the implementation of a product labeling system, again similar to the solution implemented for the converting division. "By now we had experience. The Visual LANSA part and integration with our ERP system was straightforward," says Rambow. "The biggest challenge was to find a thin client with four COM ports. We needed one port for driving the label printer, one for reading the tableau that counts slits, one for the barcode laser scanner on the packing table and one for the laser scanner on the desk that reads labels for reprinting, deleting or registering the next production step." "We had a successful but long trial period with a specific model of thin client, only to find out that it had been taken from the market by the time we were ready to roll it out. In the end we found that Chip PCs from an Israeli an supplier could meet our requirements." The Visual LANSA part and integration with our ERP system was straightforward. "With the help of the LANSA-based applications on the workshop floor and related process changes, we have increased throughput without adding any production lines and achieved a fifteen percent reduction in labor in both our converting and manufacturing divisions," says Rambow. "To put that in perspective, the converting division employs 40 people who work in three shifts per day for five days per week with 12 workstations where operators make use of the application. The manufacturing division employs 150 people who work in five shifts per day for seven days per week and have 18 workstations where operators make use of the application." 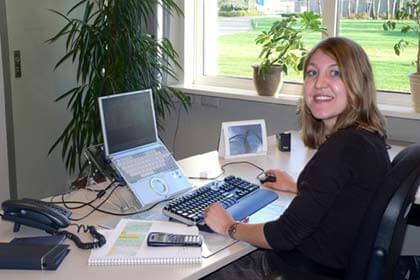 "My team consists of two analyst-programmers and three operational staff who look after the network. With this small team, who also maintain our core RPG ERP system, we have been able to put an automated workshop-floor solution in place that has cost us far less money than if we had purchased a packaged solution, or outsourced the development. Plus, we now have a 100 percent fit." "We have the most advanced IT environment of all PGI branches, no one else is uses Wi-Fi on the workshop floor or in the warehouse. Using our own in-house skills gives us control and the capability to respond fast to user requirements. We find it pleasant to work with Visual LANSA and it allows us to deliver smart solutions, quickly," concludes Rambow. PGI Nonwovens BV (PGI) is a subsidiary of Polymer Group, Inc., the third largest producer of nonwoven materials in the world, with 25 manufacturing facilities in 12 countries on four continents. The Polymer Group Inc. produces high-quality engineered materials for medical, hygiene, wiping, industrial and specialty uses. PGI Nonwovens BV in the Netherlands was previously part of the Chicopee Wiping division of Johnson & Johnson, which was acquired by the Polymer Group Inc in 1995. PGI uses the PRMS ERP solution from SSA Global Technologies, now part of Infor. PGI's IT department consist of an IT manager, two analyst/programmers and three operational staff. Over 150 users (clients/PCs) connect to the ERP system and the workshop floor solution in the converting and manufacturing division is used via 30 thin clients.